Fantasy Faire is SecondLife’s largest gathering of fantasy designers, enthusiasts & performers. A week of commerce, special events, music & fundraising over ten SIMs, created specifically for this event. All proceeds go to “Relay for Life” and the fight against cancer. Fantasy Faire is almost here! Fantasy Faire is Second Life’s largest gathering of fantasy designers, enthusiasts & performers. It’s eighteen day of commerce, special events, music & fundraising in sixteen SIMs created specifically for this event. Proceeds go to the American Cancer Society’s “Relay for Life” fundraising effort. Last year’s Fantasy Faire raised more than US$50,000! 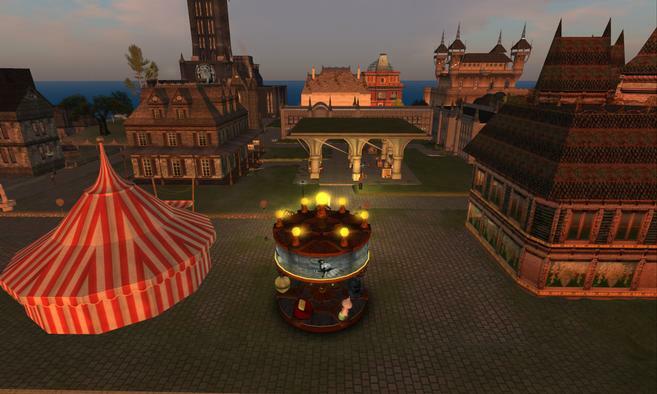 This is the NeoVictoria Project’s sixth year sponsoring the faire; this year, we’re sponsoring the Fairelands Junction! Join the NeoVictoria Roleplay group for a meet & greet! Throughout fiction, we regularly encounter three basic character arcs: Positive, Negative, and Flat. This class is devoted to breaking down these character arcs, explaining why they all can make for satisfying character progression, and discussing why not only writers should make use of them but us roleplayers. The NeoVictoria Project invites all citizens and wanderers of the Fairelands to join us for our Meet-and-Greet on the Tensors’ Flying Market SIM. We will talk to them out-of-character, explain our storyworld, and let them practice rp on our in-character stage. Many groups do them; some folks love them and others avoid them like plague. This class will delve into how SIM-wides can be used to bring communities together, how they can be abused, and what we can do as players and admins, to make them better! Players: MadMechaMessiah as Leander Hatfield; Paisley Dawes as Idalia Weed; melonnyvix as Melonny; and Hmmmph Stevaag as Hmmmph the Bumbling Traveler. Wherein the Undertaker and the Widow depart from NeoLondon to visit the Mrs. Chickenstalker’s in Athenaeum Arcana with the intention of selling Mister Hatfield’s impressive collection of funeralia. They discover the people of the fairelands have unique customs of their own …urns used for stew …urns used for pets …at least the Undertaker made a bulk sale for one customer’s personal pet cemetery! As for Miss Black and her strange ailment? The Healer and the Auditor remained sequestered with the poor female. Let us hope Mister Hatfield’s services won’t be needed too soon! Players: Asil Karu as Healer Asil Karu; MadMechaMessiah as Haskell Faustus; Snowjob as Ramu Suzuka; LadyLyndon as Jane Black; Asil Ares as Asil Clockwerk; melonnyvix as Melonny and Hmmmph Stenvaag as Hmmmph the Bumbling Traveler. Wherein the Healer from NeoLondon visits the Mrs. Chickenstalker’s in Athenaeum Arcana with the intention of selling her Sleepytime Jam, only to discover one of their members may have been infected by a dark shadow. Will the Auditor be able to find lore in the Library that will aid Miss Black, or will the shadow devour her? Can Hmmmph and Melonny start a friendship based only on drink and weapons? Is the mysterious Ramu Suzuka really blind, or is it an elaborate con? Join us and find out! Fun Fact: Mrs. Chickenstalker’s Apothecary and Dry Good Emporiums are known throughout the Sidhe Empire; they have stores on all the Sidhe worlds, as well as several of the fairelands. The NeoVictorians open a portal between the Sidhe Empire and the famed merchant realm of Athenaeum Arcana in the fairelands. In the town of NeoLondon, on the planet NeoVictoria, in the Sidhe Empire. Cerridwen~in~Chains flits like a firefly in her prison of stone, bronze and rune-locked magics. Haskell Faustus whirls downwards; a tornado of pitch-black feathers. Haskell Faustus enters, feeling first the welcoming warmth of the ward, then the soothing cool between the massive stone walls of the towering cathedral. She kens him; as he approaches the organ in the central nave, which controls the machine that she powers …which in turn …powers the city, it would come alive. Calling on the power, his mind reaching out to Cerridwen to unite and amplify their magic, he chants the secret names of the runes and draws them in the air. They make a stable funnel between the dimensions. Slowly, the others would see a portal begin to form in the stone floor. Haskell lands, the fires licking at his fingers and blazing in his eyes, turning to embers, and then disappears entirely. She felt her body weaken at the magnificent sight …unknowingly, her hand had grabbed the hand of the woman besides her. “Adventure awaits,” he tells them, then boldly steps into the portal and is swallowed. They step into a different landscape; seeing a familiar sign …they walk through the door. Her legs tremble… “This is the passage in the book where I faint.” And on that precise last word, she does. Perhaps it is time for Chickenstalker’s famous assortment of smelling salts. “I will start looking for the salts.” Hmmmph eyes a cabinet of bottles and walks towards what she hopes is her prize. We’re also roleplaying on Beq Janus‘ grand library region named “Athenaeum Arcana“. And we have an engaging roleplay cycle planned that includes many FREE roleplay props. Our schedule is below. Come and join the NeoVictoria Roleplay Group for some steampunk roleplay! Only the first scene is set in NeoVictoria SIM; the rest are in the Athenaeum Arcana SIM in the Fairelands. A portal is opened to the fairelands by Cerridwen, the Sidhe of the Cathedral. The NeoLondoners make their way to the grand bazaar of Athenaeum Arcana. On the bazaar faireland of Athenaeum Arcana, citizens of NeoLondon are visiting an outpost of Mrs. Chickenstalker’s Apothecary and Dry Goods Emporium, bringing new wares from the Sidhe Empire to present for your review. Healer Asil Karu will be showcasing Mrs. Chickenstalker’s famous sleepy-time jam. Free samples! Miss Essie is taking some time away from the Widow Weed, and has promised to help manage the store. What trouble might she find in the stacks? Healer Asil has a new set of potions to present, and will also be available for private consultations. Miss Essie is back at the register. Join her as she explores the shop. Healer Asil and Mister Hatfield will be showcasing their wares. Join them! Mister Hatfield is packing up his coffins, for the return to the NeoLondon. Don’t miss this last chance to sample goods from the Sidhe Empire! On the circus faireland of Anansi, tempers run hot. The company is divided, as rivalry between the acts pushes the performers to risk ever-increasing danger. Will tonight be the night someone goes too far? Laysundra Ashes – Gabilondo (tsukinanoodlypooh), Joe McMullen (joemcmullen, DeathlyLovely, ColbyDark, Spica Inventor, LordTempus76, tonydupree48 as the enthusiastic audience! This roleplay is the fourth in a series being produced by the NeoVictoria Roleplay Group for Fantary Faire and the fight against cancer. Read more about it at our page on the FF2017 site; here’s the link. On the circus faireland of Anansi, its troupe of performers prepare their acts. But all is not well; dissension brews between the ladies of the high-wire. Could their competition prove too much for the talent scout from NeoLondon? This roleplay is the third in a series being produced by the NeoVictoria Roleplay Group for Fantary Faire and the fight against cancer. Read more about it at our page on the FF2017 site; here’s the link. The circus troupe performs, with varying degrees of success. Lloyd is in the audience, taking notes. He recognizes the Particle Ribbon Dancers; these twins fled the Sidhe Empire when a blackmail plot they had cooking was exposed. Murasaki Kaligawa, Scooby Loochie-Doo, Xabbu Parx and Rend Bertrand as the enthusiastic audience! This roleplay is the second a in series being produced by the NeoVictoria Roleplay Group for Fantary Faire and the fight against cancer. Read more about it at our page on the FF2017 site; here’s the link. Doctor Seito Akai (adept in the Anubi caste of the Imaja Order), makes a deal with Cerridwen (power center of the Cathedral of Air and Darkness) to open a portal to the Fairelands. Lloyd Felix, hoping to save his failing circus, convinces her to point said portal to the circus land of Anansi. With the help of Essie (a half-fae), they create the passage and the NeoLondoners go adventuring. This roleplay is the first a in series being produced by the NeoVictoria Roleplay Group for Fantary Faire and the fight against cancer. Read more about it at our page on the FF2017 site; here’s the link.